SkillsUSA is an integral part of career and technical education (CTE). Teachers infuse the organization’s activities into their instructional programs, enabling students to gain real-world applications to their studies. 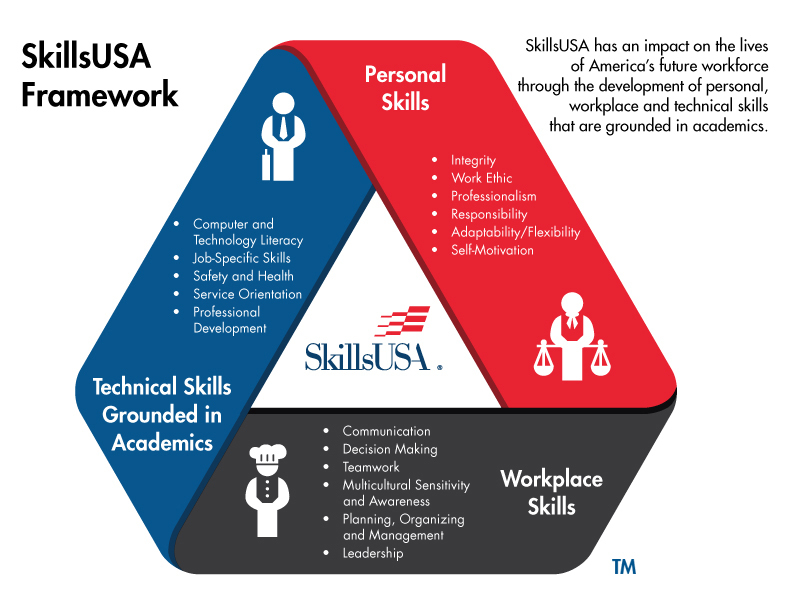 When SkillsUSA is integrated into the CTE program, all students develop the personal, workplace and technical skills that comprise the SkillsUSA Framework. For example, the newly released SkillsUSA Career Essentials: Foundations and SkillsUSA Career Essentials: Experiences are available through SkillsUSA to embed into curriculum, offering your students experiences to better prepare them for career success. To learn more about the new Career Essentials suite of products, visit www.careeressentials.org. Your classroom will come to life as students see the connection between what they are learning today and their futures. Just as your lab provides contextual moments, your classroom can provide relevancy in developing leadership, communication and teamwork skills that develop the whole student. Ensure all stakeholders from administrators to parents, students and other teachers understand the integral nature of SkillsUSA to your CTE program. Ensure parents and families understand that SkillsUSA is integral to your program by placing information directly into the syllabus. Use the Parent Letter and SkillsUSA Brochure template as guides. 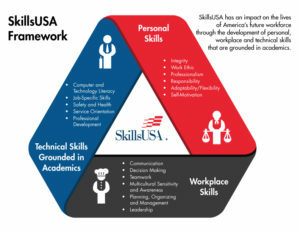 Use the SkillsUSA Framework Flier and Graphic in your program materials to draw attention to the development of personal, workplace and technical skills grounded in academics. Show the framework video to students, parents, administrators, teachers and members of your business community so they understand how SkillsUSA ensures career readiness. Use the Career-Ready Starts Here lesson plan to embed SkillsUSA into your chapter activities. A SkillsUSA chapter exists as a teaching tool where intentional learning can take place in a safe environment. Students are able to make mistakes and learn from them with your guided practice, which moves them along a continuum of awareness to demonstration and eventual mastery level learning. Assess their career interests by taking an online assessment. Browse career paths and check out videos of real people working in the field.